Through three boxsets, the UNIT audio range has already established itself as one of Big Finish’s most enthralling and engaging, perfectly blending the mannerisms and sensibilities of both classic and modern Doctor Who while proving more than capable of standing tall without the help of the wayward Time Lord. For the much-anticipated fourth set of stories, UNIT: Assembled seamlessly brings together members of both eras of UNIT, highlighting the similarities that span generations as Earth’s original ruling denizens once more awaken to wreak havoc. Matt Fitton’s ‘Call to Arms’ opens the set on a more reflective and personal note to allow the audience to become at least somewhat familiar with the post-UNIT lives of John Levene’s John Benton and Richard Franklin’s Mike Yates, the two who quite explicitly serve as a doorway to the much beloved Third Doctor era of Doctor Who here. As characters and Doctors move on, it’s rare to revisit past companions and acquaintances, especially in their more mature years, but even taking the small step to reveal that Benton moved on from selling cars to owning a pub is a welcome piece of information that further defines such a well-liked character. Of course, it’s not long before Jemma Redgrave’s Kate Stewart and Ingrid Oliver’s Osgood find themselves in the presence of Benton and Yates, both keen to compare notes on the Silurians after a rebel faction led by Jastrok begins to hunt down their perceived apelike enemies in humanity. ‘Call to Arms’ does an admirable job in explaining and setting up this major threat, at the same time displaying both the practical strength and intelligence of Osgood while not forgetting just how enthusiastic about preceding legends she has always been along the way. Although the dialogue and hunting mentality of Jastrok would seemingly be more fitting of a typical Sontaran, the blisteringly intensified action sequence spectacularly highlights the extremist Silurian mentality and the ingenuity and capability of UNIT members no matter their age, and ‘Call to Arms’ is a great opening act that sets the bar extremely high for those stories to follow. Guy Adams’s ‘Tidal Wave’ takes a slightly different approach to its ‘Call to Arms,’ unquestionably setting yet larger events in motion but telling what could almost qualify as a two-hander despite the presence of other characters as Osgood and Jo Jones become acquainted and try to keep the peace between humanity and its reptilian predecessors. Once more, Osgood makes no secret for her adoration of those whose footsteps she is following at UNIT, and the chemistry between Ingrid Oliver and Katy Manning is dynamic and natural from the very start. ‘Tidal Wave’ and Project Charybdis very much hearken back to the experimental technologies and base-under-siege setups that worked so spectacularly in the classic series, and the result is just as enthralling here as humanity and Sea Devil try to understand each other on a representative basis and forge an uneasy trust. Those familiar with previous Silurian and Sea Devil tales may feel an even greater wave of familiarity as an attempted resolution certainly recalls earlier attempts by the Doctor to achieve some semblance of peace by pleading to the internal decency of those long-forgotten rulers of Earth, but the greatest achievement of ‘Tidal Wave’ is showcasing just how profoundly the Doctor impacted Jo and how strong she can be in even the most uncertain of circumstances when needed the most. Guy Adams is also tasked with writing the third entry in this set, ‘Retrieval,’ a story that raises the stakes on both a very personal and global scale with an unrelenting sense of danger and uncertainty. Indeed, never before has a single Silurian been so overtly menacing and fantastically dangerous as the fiercely unwavering warrior Commander Tryska. There’s no question that UNIT is very much not in control of this tense situation as its members try to find a means to fight back, but the very personal nature of the attacks and seeing such strong heroes put through such torment as they try to carry on with their mission is frighteningly effective and showcases the camaraderie and well-developed characterization of all involved, expertly setting the scene for a bombastic finale in the process. Whereas the aggression of the Silurians seemed a bit off earlier on, the malice and determined intent here is written and conveyed superbly while remaining true to the more intelligent background of these foes. Matt Fitton’s ‘Unified’ closes the set out as the reptilian threat grows even more tangible, intensifying the danger and emotions for both sides in admirable fashion. With the expanded UNIT roster fully present, Fitton expertly manages to split the human forces to take the fight to Jastrok and his followers on multiple fronts. Yet while simply writing an immense physical and mental battle against a hostile force would be enough for an average script, each character manages to attain a moment in the spotlight that reaffirms just how vital and strong each member of UNIT can be and always has been. At the same time, the reptilian invaders are written with plenty of emotion and, despite the extremist actions, Richard Hope as their leader is able to imbue a subtle sense of empathy to their plight and actions, creating an altogether more satisfying and enriching tale that is unafraid even at the end of continuing to explore its major players as the moral and political drama continue to unfold. With a tidy resolution that handsomely pays off the intrigue and development that have occurred before, ‘Unified’ is a strong conclusion both to this blending of UNIT generations and to this Silurian faction’s actions. 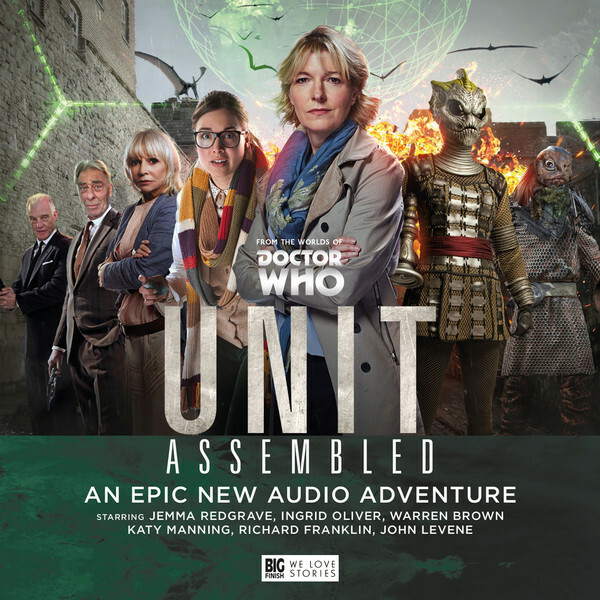 As a whole, UNIT: Assembled is yet another unqualified success for Big Finish that manages to bring together and pay tribute to some fifty years of continuity in one sublime package. With immense performances from all involved and a true sense of family and respect that spans generations within UNIT’s ranks, this is the perfect gift for both long-term and more novice fans alike. While in some instances it does seem like a desired sense of familiarity is an overriding force, the brisk pacing, the ability to be both bombastic and reflective, and the escalating danger are sure to entrance from beginning to end, and the usual strong sound design creates an immersive world in which sentient reptiles and mammals can once more- to some extent, happily or not- co-exist.